In many animals, males fight for territories. Getting a good territory and making sure other males don’t steal it is very important! Males use these territories to attract females for mating. The males that get the best territories are more likely to mate with females and have more babies. Only the males that have babies will pass on their genes to the next generation. 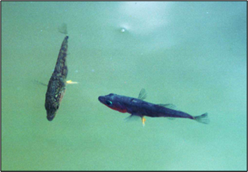 Stickleback fish use the shallow bottom areas of lakes to mate. 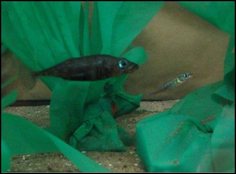 Male stickleback fish fight each other to gain the best territories in this habitat. In their territories, males build a nest out of sand, aquatic plants, and glue they produce from their kidneys. The better the nest, the more females a male can attract. Males then use courtship dances to attract females to their nests. If a female likes a male, she will deposit her eggs in his nest. Then the male will care for those eggs and protect the offspring that hatch. 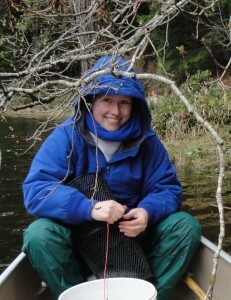 Alycia is a scientist who is interested in understanding what makes a male stickleback a good fighter and defender of his territory. Perhaps more aggressive males are better at defending their territory and nests because they are better at fighting off other males. She used sticklebacks she collected from British Columbia to test her hypothesis. In her experiment, 24 males were kept in 6 large tanks, with 4 males in each tank. Alycia watched each of the 24 males every day for 10 days. She recorded the behaviors of each fish when they were competing for territories, defending their territory, and building their nests. She also recorded the size of the males’ territories and whether they had a nest each day. 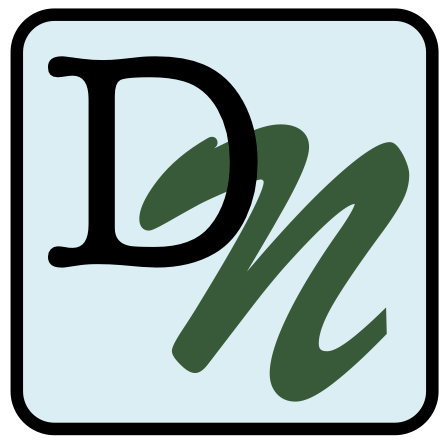 More news on Alycia’s work on stickleback fish can be found at her BEACON blog post, “Making and Breaking a Species” and her blog post for the MSU museum. A male (right) defending his territory from another fish (left).